No fruit recipe. Fruit free. All nuts, no fruit. 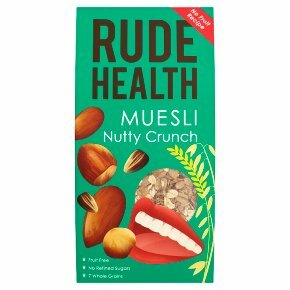 The world's crunchiest muesli. 7 whole grains. High fibre. No added salt. With granola. Clean ingredients. No refined sugars. No artificial anythings. Non-GM. Vegetarian Society approved. Kosher - KLBD.Start your day with a crunch. Toasted flakes. Granola bits. And nuts, nuts, nuts. This is a whole textured experience to wake you up from your tongue to the tips of your toes. There are soft flaked grains to add a little smoothness, and the granola gives you little bundles of honey-sweetened fun. But this one's all about the nuts. There's also little bites of sunflower and pumpkin seeds to keep your tastebuds and your body perky and ready for the day. No refined sugars Not all sugar is the same. We use a little unrefined sugar in our granola clusters, which is made completely differently to the regular stuff. It's less processed and made at lower temperatures in smaller batches, so minerals and micronutrients from the cane juice are retained. And as there's no dried fruit in this muesli, it's lower in sugar anyway. Tuck in!